At the beginning of the Vitebsk highway there is one old building — the house number 9, which survived to the present day. One hundred years ago, in this house, which is located under the viaduct, placed women’s prison. The decision about building of the prison in the country was made in 1849, but engineering of a «prison of the castle» began only in 1857. In the imperial times confinement was not the main form of punishment, unlike the death penalty. As an independent form of punishment imprisonment was introduced in Ivan IV the Terrible times. Later, in 1744, during the reign of Elizabeth, it was promulgated a decree about the separation of men and women in the prisons and jails. Women were jailed because of various infractions: bigamy, theft, murder, infanticide. Among the women-criminals there were such ones, who amazed the public by their hanky-panky. Among them was also the legendary Russian criminal-adventurer with Jewish origin, known by the nickname «Sonka the Golden Hand». We are so much fun to watch how the others are cheated till we are not the victims ourselves. The Golden Hand’s popularity was so great that in the era without the television news everyone recognized her on the street. The best thieves of Europe worked her team, in its arsenal there were many devices, required for action: false nails, which where a crook could hid small gem stone, shoes with special heels, that could stick jewelry «timely», dress-bag, where Sonya hid plunder… But the main thing in her arsenal of tricks was undoubtedly genius for acting, which helped her to get out of any situation. When Sonka the Golden Hand for the first time was on the dock, it reported by all the Russian newspapers. There is a theory that the famous criminal in the late 19th century, was in prison in Smolensk. A few days spent here, Sonia enchanted guards — she read poems in different languages for them, told stories about life in distant lands … As a result, one policeman made getaway and escaped. After that he was caught and tried, and Sonia went to «bomb» the rich fools. Once she even robbed own lawyer, but he still defended her. Unlike the Golden Hands other women were not so lucky and had a humble life in prison. There, they were engaged in spinning flax and wool, woven canvas and simple cloth, knitted stockings sewed new and repaired old clothes. Three dozen women-prisoners could span 12 pounds of linen only during one year, two pounds of wool and weave 520 yards of linen. Not surprisingly, built on the highway Vitebsk «prison fortress» occupies a large area. Emerged in the era of transition from baroque to classicism, this architectural object is interested by three-dimensional composition. Unfortunately, as a result of the devastation of World War II the building lost its original floors and the layout. 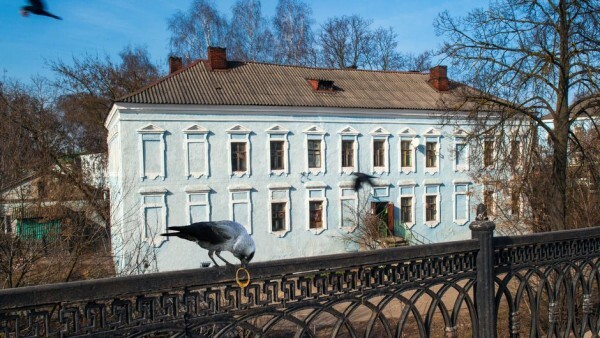 Currently, the «Dweling House » in Vitebsk highway, 9 is an object of cultural heritage, and is used for housing.